In 1940 as the German Army marches inexorably through the green fields of Belgium towards France. Many citizens of Paris begin hasty preparations to evacuate, throwing treasured possessions willy-nilly into hand carts, horse drawn carriages, the baskets of bicycles or, if your were indeed fortunate enough to own one, into motor vehicles. But the vast majority simply took to the road on foot, carrying their meager estate, tied in a bed sheet or stuffed into battered suitcases. As in all catastrophic upheaval, be it a natural disaster or one caused by man, to choose what to take or what to leave behind can be, for some, just too overwhelming. These individuals simply walk away with nothing, melt into the chaotic, seething mass of humanity, never to look back and seemingly, to disappear and, even with the eventual restoration to normalcy, never again returning to inhabit their former lives. 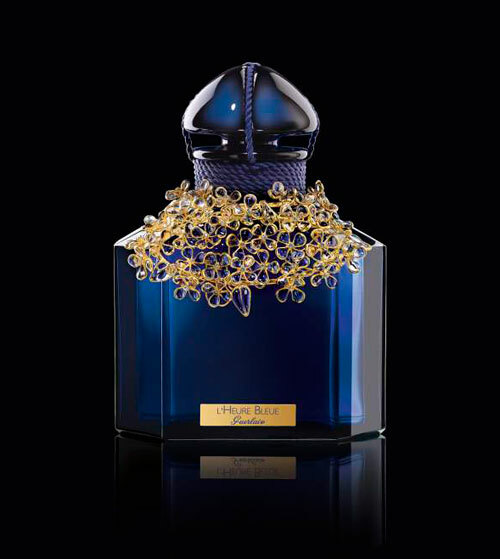 And so it was for the pretty 21 year old Mlle de Florian. When confronted with the devastating decision of what to leave and what to take she couldn’t choose. She found herself careering wildly through the vast rooms of her deceased Grandmother’s apartment, pulling paintings from the walls, only to abandon them moments later or distractedly rifling through the drawers of cabinets and bureaus but taking nothing. Eventually realizing she’s incapable of mobilizing coherent thought or action Mlle de Florian just simply locks the flat’s door and walks away. The apartment and it’s contents are abandoned, perhaps deliberately forgotten. Cobwebs gather in corners, dust settles layer upon layer covering the furnishings in a diaphanous grey pall and over time the dripping tap above the kitchen basin leaves the pristinely white stone indelibly marked with a horrible greenish black stain. Mlle de Florian lives to the venerable age of ninety-one, never once returning to the flat in Paris . After her death the executors of her Estate are intrigued to discover the existence of the apartment. It has remained locked, unvisited, untended, for nearly seven decades. What would they find inside? The apartment lay in the ninth arrondissement, near the Opéra Garnier, Folies-Bergères and the Galeries Lafayette. This area of Paris owes much of it’s beauty to Emperor Napoleon III and Baron Haussmann’s determination to create a modern Paris. A Paris of grand boulevards green spaces and elegant architecture. The Rue Condorchet is a typical example of classical Haussmannism with it’s monochromatic stone buildings, their façades organised around horizontal lines that often continue from one building to the next and balconies and cornices that are perfectly aligned without any noticeable alcoves or projections. It’s on this charming street, early one morning, we find Monsieur Olivier Choppin-Janvry, hurriedly making his way to number 110. He had forgotten that rue Condorchet is a one-way thoroughfare and the subsequent lengthy detour to enter the street from the Place Lino Ventura has caused him to run late for his appointment with the apartment building’s concierge, Monsieur Gilbert. The concierge waits patiently for him on the footpath, apologies made, Monsieur Choppin-Janvry is ushered through imposing wooden doors into a gloomy vestibule and from there is shown up the handsome marble staircase to a door on the second floor. Monsieur Choppin-Janry is here to conduct an inventory and evaluation of contents in the abandoned apartment at the behest of Mlle de Florians heirs. Politely dismissing the assistance offered by the overly curious concierge, Monsieur Choppin-Janvry is left alone to struggle with a resisting lock. After some determined jiggling the lock finally yields and the door reluctantly swings open. He is at last inside the apartment, the first person to have crossed its threshold in nearly seventy years. There is an all pervading gloom for the power is either disconnected or the light bulbs have long stopped working their efficacy eroded by years of non-use. Making his way carefully along the wide hall towards the formal rooms that overlooked the street, Monsieur Choppin-Janvry is acutely conscious of the smell of old dust and the mustiness of mildew. Entering a large room he immediately moves to the large bank of windows facing the street and with some difficulty forces them open . That done he turns his attention to the wooden shutters. Their rusting hinges shriek in protest as he manhandles them open. The room is now flooded with morning sunlight. He finds himself standing in a large dining room, a magnificent table covered by a yellow damask table cloth commands centre stage, ornate candelabra their candles showing use, sit either end of it. A large credenza covers almost the entire length of the back wall, its shelves groan under the weight of fine china and to the right of that, is a beautifully carved fireplace and gracing it’s chimney-piece are objets d’art and a sensual second Empire bronze statue of Persephone fleeing Hades. Heart pumping with mounting excitement, Monsieur Chopin-Janvry quickly moves through the rest of the apartment, throwing open windows and shutters. Rooms that had not seen light of day for seventy years were now revealing their startling treasures. Paintings, gueridons with ormolu, Louis XV chairs, an exquisitely feminine bureau with beautiful inlays of fruit wood and in one of the small rooms overlooking the courtyard a collection of Disney toys including Mickey Mouse, Porky Pig and a moulting taxidermic ostrich. But the room that interested him most was a room with exquisite moulded ceilings and walls covered in embossed, eggshell blue silk. Unfortunately here, water damage was evident causing the silk to fall away thus exposing the plaster beneath and a dark stain of mildew to disfigure the ornate ceiling. The furniture is intensely feminine, brocaded Duchesse de Brisee chairs, a hand painted table for playing cards, marble busts and delicate gueridons on which stand, pretty porcelain vases. And along one entire wall is an enormous painted Louis XVI mirror bedecked with garlands of flowers and candelabra. Opposite this stands a marble fireplace and on it’s mantelpiece are large chinese porcelain ginger jars. French doors framed by faded yellow silk curtains lead to a small balcony and beside this opening is a beautiful dressing table, ornately carved with fleur de lis and griffins. A lovely piece of whimsy. On top of this beautiful dresser were the accoutrement one would expect a lady to use when attending her toilette, silver backed hair brushes, crystal bottles of long ago evaporated perfumes and jars containing powder and unguents. This room is undoubtedly a Boudoir. Today we might give a room like this the unimaginative title of a dressing room but in the Belle Epoque period this room was used for so much more. The Boudoir of the Belle Epoque era – from 1870 to the beginning of the first World War in 1914 – was a combination of drawing room and dressing room. It was where a beautiful woman might entertain friends and lovers, or receive tradespeople such as jewelers, hairdressers and dressmakers. She would also dress here in preparation for an evenings entertainment at the Opera Garnier or perhaps going to Maxim’s for dinner. Indeed if you look closely at the dressing table you will see candles long past their prime. They’re little more than stubs suggesting the last inhabitant of this room has needed their illumination to see better for applying her maquillage. Monsieur Choppin-Janvry is suddenly of the opinion that this room has been closed much longer than the rest of the apartment. There is no evidence to suggest that the 20th century has ever intruded within these pretty walls. In fact he is almost certain that Mlle de Florian never lived in the apartment she may have been a regular visitor but it was never her principal residence. There was too little of the 20th century and way too much of an earlier period. That period being the Belle Epoque. He moves further into the room there is a chill in here despite the sun flooding in through the open French doors and a pervasive perfume of roses seems to linger in the air. A zephyr like breeze eddies around the room causing the pages of a letter to lift from the dressing table and flutter to the floor. As Monsieur Choppin-Janvry bends to retrieve a page from the floor he notices tucked in behind the overflowing bookcase something wrapped in a silken shawl. It looks as if it’s a painting and a large one at that. Carefully maneuvering the painting from behind the book case with it’s towering pile of dusty tomes and mindful not to damage the canvas, he carries it to the chaise-lounge. The temperature in the room has grown noticeably cooler and the scent of roses grows stronger almost cloyingly so. Monsieur Choppin-Janvry hands begin to tremble as he gently disentangles the shawl from the painting. He is convinced he is about to make an important discovery. The painting is a portrait of a beautiful young woman. She sits, leaning forward in a chair. A chair he recognizes immediately as the very one on which the painting now rests. 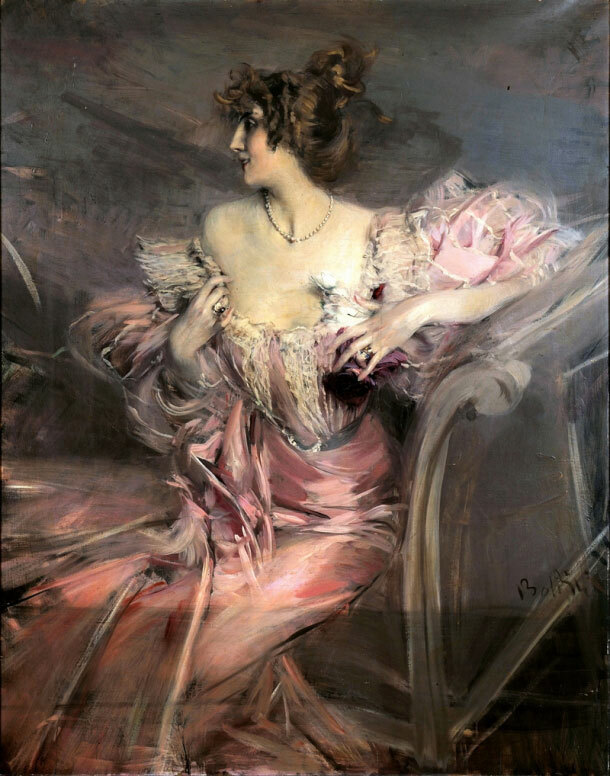 Her face is in profile, the luxuriant dark blonde hair is piled atop her head, around her neck she wears a strand of baroque pearls and her long elegant fingers play flirtatiously at the extreme decolletage of a beautiful pink mousseline evening gown. Choppin-Janvry intuitively understands he is looking at the face of the woman in whose apartment he now stands but even more exciting than that realization, is the painting itself. It is with the unconscious uttering of these words that the room is suddenly plunged into darkness. Momentarily confused Monsieur Choppin-Janvry realizes the shutters have somehow broken free from their moorings and have slammed shut thus blocking out the light. Adrenaline courses through his body and a feeling of unease causes him to hurry towards the chinks of light shining through the closed shutters. And when the plethora of tables and chairs in his path impede smooth passage, panic threatens to extinguish all rational thought. He is convinced he is no longer alone. With racing heart, he peers around the darkened room, his eyes desperately seeking reassurance that he is indeed alone. And just as he reaches to push open the shutters for better illumination he is distracted by a shadowy movement near where the portrait stands. “Mon Dieu!” Through the aqueous gloom a chimerical figure materializes, and with the sibilant whisper of silken gown, suddenly before him, is the beautiful woman from the painting. Her pink mousseline gown glowing eerily in the nubilous shadows. In that startling moment, just as Monsieur Choppin-Janvry is about to commit to a terrified shriek, two things occur simultaneously: his mobile comes shrilly to life and a mischievous breeze plucks the shutters from his grasping fingers and casts them wide open. Returning to the room he is again drawn irrevocably to the portrait. It’s allure impossible to ignore. A beautiful woman by anyone’s standards and if the tilt of her rounded but determined chin is any indication, a wilful and deeply passionate one, at that. Marc Ottavi moves unhurriedly into the room. He walks as if in a trance. His eyes, huge with wonderment, track slowly around the chamber. The boudoir is gorgeous, it’s faded splendor reflecting the exquisite taste of the era he’s most passionate about, the Belle Epoque Period. The faint perfume of roses still linger in the air but Olivier barely notices its haunting sweetness. His mind is too much occupied by the monumental task of sifting through the room’s clutter, searching of something that may, or may not exist.